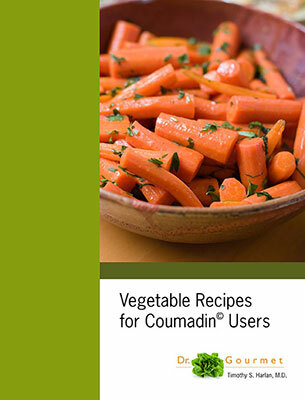 The healthy eating guide for Coumadin (warfarin) users. 80+ recipes with Vitamin K content along with a detailed eating plan so you can keep your INR stable. If you are on Coumadin, this book is indispensable! 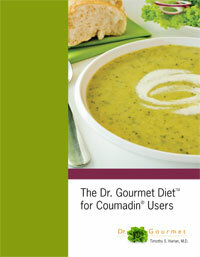 With The Dr. Gourmet Diet for Coumadin Users, you CAN follow a normal, healthy diet while taking Coumadin. EAT real, delicious food without worry! Using The Dr. Gourmet Diet for Coumadin Users, you’ll receive six weeks of healthy menus that will show you that eating on Coumadin can be delicious, healthy, and varied. When you place an order with us, we place an order with our printer and the books, once printed, are then shipped directly to you. This process may take up to three weeks. If you have a question about the status of your order, please send us an email at sales@drgourmet.com and we will be happy to assist you.